With the men’s year end tournament moved to London, Shanghai gained a Masters 1000 series tournament. In the finals, Nikolay Davydenko stamped his name on the inaugural trophy by beating Rafael Nadal 7-6, 6-3. For Davydenko, it was his third career Masters’ shield and his fourth title of the season. Shanghai marked Nadal’s return to the finals since his hiatus due to knee tendonitis in June. The Spaniard looked in great form all week. Yet, Davydenko was no slouch. The Russian took out second seed Novak Djokovic in the semifinals after losing the first set. In many respects, this match was reminiscent of the 2008 Sony Ericsson final with Davydenko assuming the role of aggressor. Immediately, that tactic paid dividends for the Russian, particularly in the long rallies. With Nadal serving at 1 all, Davydenko surprised his rival by crushing a forehand winner up the line. Then, by producing some great angles, Davydenko came up with a backhand volley winner for love-40. 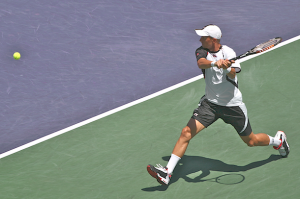 Subsequently, Davydenko secured the break with a swing volley winner. Afterwards, with a couple of forehand winners up the line, Davydenko consolidated the break for 3-1. Next, a backhand error by Nadal gave Davydenko a 15-40 edge and the opportunity at a safety net. However, with Davydenko missing two forehands up the line, Nadal eventually got out of jail. Serving at 4-3. Davydenko’s miscue on a forehand gave the Spaniard his first break point. Despite the Russian erasing that one, later, another forehand mistake resulted in Nadal leveling the set at 4 a piece. At 4-5, Davydenko made a forehand crosscourt error to gift Nadal set point at 30-40. But, after flubbing a previous overhead, Davydenko handled a lob for winner and kept the set alive. Ultimately, the set went to a tiebreaker. With a backhand volley winner on a high ball, Davydenko obtained a mini-break for 1-0. Shortly thereafter, Nadal sponged out Davydenko’s edge with a spectacular backhand reflex volley. Unrelenting, daredevil Davydenko fired another backhand down the winner to secure another mini-break for 3-2. When Nadal splayed a forehand off a deep return, Davydenko extended the gap to 6-3. Later, with a backhand down the line winner, Davydenko put a period on the set. Davydenko began the second set with a love game. After Nadal held comfortably, with a swing forehand volley winner, forehand crosscourt and up the line winners, then an ace, the Russian kept his nose in front 2-1. Then at 2 all, Davydenko dumped a crosscourt forehand into the net giving Nadal break point. Yet, with the Spaniard unable to place the backhand return in play, Davydenko escaped. Despite struggling, Davydenko closed out the game to stay ahead 3-2. After pressuring two errors from Nadal and with a crosscourt backhand return winner, Davydenko arrived at triple break point. 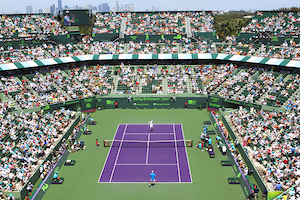 When Nadal’s ball landed long, Davydenko captured a 4-2 advantage. By continuing to gamble, Davydenko easily consolidated for 5-2. Nadal then held to compel Davydenko to serve out the match. After an initial forehand mistake, Davydenko converted on a forehand down the line winner. Davydenko outlasted Nadal in two long rallies and with a forehand up the line winner earned championship point. When Nadal’s forehand barely missed, Davydenko wrapped up the title. Indeed, this was a strange tournament with a contagion of retirement, nine in total. Except for the finals, each round claimed a player with U.S Open champ Juan Martin Del Potro and Andy Roddick going out in their opening match. With this win, Davydenko is almost assured one of the eight spots at the year end tournament.